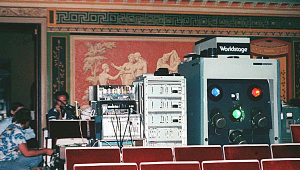 Just over fifteen years ago, Barco introduced the Light Cannon, the first LCD video projector suitable for large screen video projection. Prior to then, if you wanted to show video to more than a handful of people, you’d have probably used a GE Light Valve projector. The GE Light Valve or Talaria, to give it its correct name, was a huge beast, with some models weighing 700Kg and drawing 50A at 240V. The Talaria used a Light valve to modulate the light from an up to a 2KW Xenon source and could easily project an image 40 feet wide, achieving 8,000 lumens on a 15 x 20 foot screen. The Talaria was initially available as a single unit, producing all three colours from a single light valve however that suffered problems of interaction between the colours, especially red and blue. To overcome this problem a version of the Talaria with two light valves was introduced in 1987 – one valve supplying green and the other split between red & blue. The ultimate Talaria though was that pictured on the right, with three light sources and three light valves and costing well in excess of £100,000 (1980 prices). 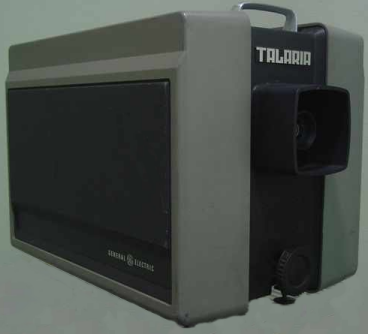 Unlike modern video projectors which are pretty much point and go, the Talaria required an expert to set it up, not only getting the optical convergence correct between the three units, but about 46 trim pots had to be adjusted correctly to get a proper image on the screen. All in all, about 4hours work that couldn’t be started until the room could be dark and the lighting guys had finished their focus. 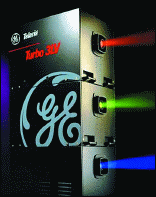 The Talaria worked on a similar process to the earlier Eidophor projector. Invented in the late 1940’s, the Eidophor projector works by shooting electrons at an oil film, which results in the film curving where the electrons hit and this changes the oil in to a local fine grained mirror, which light is then reflected off. The film slowly rotates so that the electron beam can act on a fresh surface, whilst the “spent” surface is reset ready for next use. 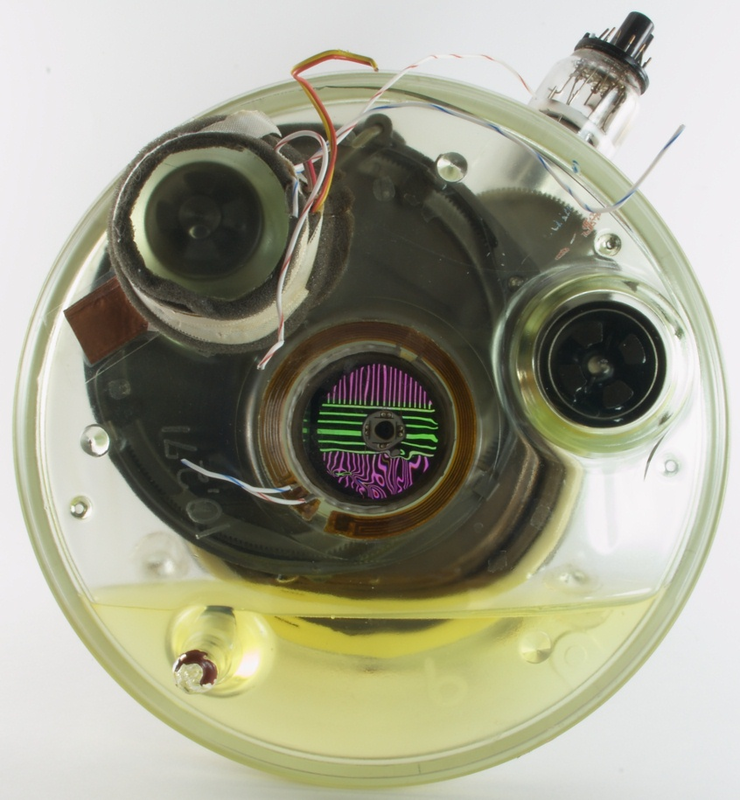 This all happens in a vacuum, which is why a typical Ediophor projector took over an hour to warm up – firstly the system had to be pumped down to create the vacuum and then the oil was heated to the correct operating temperature. 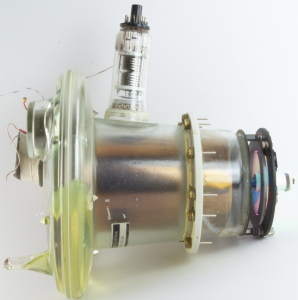 The light valve, used by the Talaria was a self-contained unit, so although there was still a 30 min warm up time, the unit was sealed, so no additional vacuum needed to be created. The light valve also used the oil to produce a lens, rather than a mirror, which was more efficient, though, like the ediophor still suffered from being susceptible to physical interference – if someone bumped in to your Talaria, it could take up to 10 minutes for the picture to settle down. Luckily the life of the light valve was was about ten times longer than the 100 hours of the CRT gun in an Eidophor, but the until still cost around the equivalent of £150 per hour to run. A light valve showing the oil in the bottom of the unit.